With money you cannot buy love, but a shirt made of gold. And this should be a breeze womanizing. That is true banker Datta Phuge from Pimpri-Chinchwad in India hopes. The 32-year-old bachelor spent no less than 140,000 Euros to the remarkable garment. At the 3.5-pound vest hear a series of equally gaudy rings, bracelets, necklaces and a belt. A team of fifteen goldsmiths worked there for two weeks in. Datta Phuge is convinced that he thanks his golden outfit will turn into a woman magnet. "I know I'm not the smartest man in the world, but this must surely impress any woman" He told an Indian newspaper. "The shirt was one of my dreams. 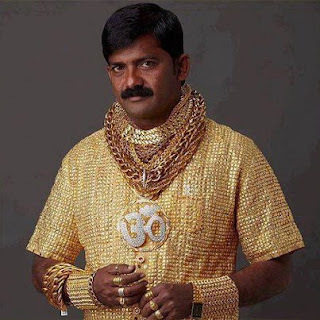 It makes my reputation as the golden man of Pimpri completely."